To commemorate the centenary of the death of Saki (Hector Hugh Munro) on the Somme on 14 November 1916, Withnail Books have just published a booklet of a rediscovered early piece by him. 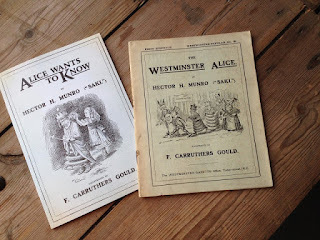 'Alice Wants to Know' (1902) was a late extra in the series of political satires, illustrated by F. Carruthers Gould, that Saki wrote for the Westminster Gazette, and appears to have been overlooked since. It was not included in the original paperback edition of the collected Alice sketches. This new publication also includes another rare squib, 'Government by Picture-Postcard' and has been designed in sympathy with that Edwardian Saki 'Alice' paperback. It is in a limited edition of 45 copies and is sure to become a collectors' item among Saki and 'Alice' enthusiasts.